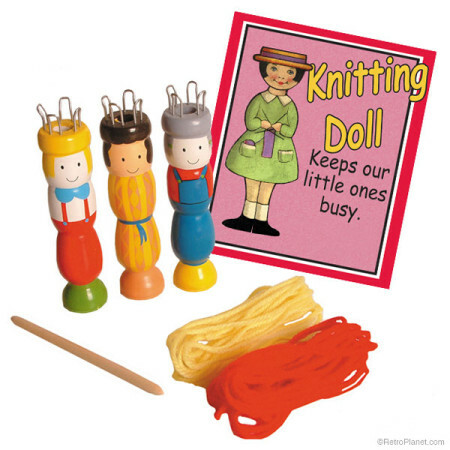 A knitting doll kit is a great way to introduce the kids to creative crafts. Don’t let the simplicity fool you – there are many high-end crafts that can be made using spools. Spool knitting, (aka French knitting, cork knitting, or punnikpopje) is one of my earliest crafty memories. My spool knitter was a simple green plastic affair – just a tube with four flimsy tines sticking up – but I loved it and spent hours patiently knitting foot after foot of acrylic peach yarn into a tube with the lofty goal of making a rug. I ran out of yarn somewhere around potholder-size and the rug never materialized, but I still have fond memories of my spool knitter. That’s why I couldn’t contain my joy when Retro Planet started carrying a Knitting Doll Kit that’s quite similar to the one I used as a kid. The kit consists of a wooden spool (painted to look like a doll), a wooden needle and yarn. Spool knitting (so called because they used to be made with nails pounded into an empty spool of thread) is a great craft for kids who are ready to graduate to something more advanced than sewing cards and Popsicle sticks. It’s easy, simple, and fun, and it’s a wonderful way to introduce a child to the world of knitting. Frustration is kept to a minimum because there’s only one needle to contend with and one simple stitch to learn. Plus, spools are very portable so they’re perfect for long car trips, plane rides, and family vacations. The best part of spool knitting is its versatility. Kids can try simpler pieces like potholders, cat toys, flowers, headbands, and hats. Adults and teens can get in on the fun with intricate Celtic knot work and jewelry pieces made from ribbon or soft wire and beads. In fact, the only limit to spool knitting is your imagination. Anything remotely yarn-like can be knitted up with your knitting doll. I’ve even seen people make “yarn” out of plastic grocery bags! Check out this spool knitting Pinterest board I found for project ideas, pictures of homemade spool knitters, and more. Did you have a knitting doll when you were a kid? Do you use one as an adult? Share some of your crafty memories with us below.